Brentford remain without a win in the Championship this season after Reading held them to a draw at Griffin Park. Josh Clarke exchanged passes with Neal Maupay and blasted in from a tight angle to give Brentford an early lead. Reading improved in the second half and levelled through Liam Kelly's penalty after Rico Henry pushed Tyler Blackett to the ground from a free-kick. Sone Aluko went close to finding a winner for the away side, grazing the bar with a powerful shot from 30 yards. The Bees have been continually frustrated in their efforts to turn promising performances into wins this season and this match followed a familiar theme. Clarke gave the hosts a lead their play deserved before Maupay forced goalkeeper Vito Mannone into a good stop. Jaap Stam's side found their rhythm after the break, with Kelly bright on the wing and substitute Roy Beerens forcing Daniel Bentley into a flying stop. 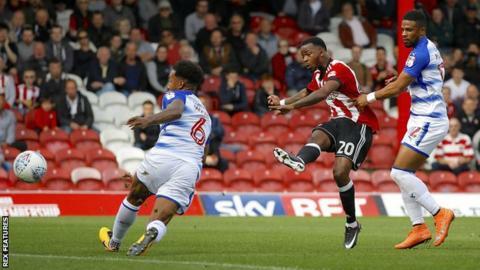 Brentford's Florian Jozefzoon dragged a shot wide while clean through, Ollie Watkins fired over and Andreas Bjelland was twice denied by Mannone before Aluko went close to taking the points for Reading. "Two of our boys have been tackled from behind and we get nothing. "Three of their players were already on bookings and some of the tackles were just allowed to go on. All we are asking for is consistency. I didn't think the referee was very good today. "We are talking about five big decisions and only one has been given and that can't be right at this level with professional officials. "That was probably the most frustrated I've been because a lot of the decisions didn't go our way and I couldn't even have a conversation with the fourth official." "We are very pleased because we had a hard time in the first half and didn't play to our usual standards. "Our choices on the ball were not good enough and we gave the ball away too quickly, and that is dangerous with the players Brentford have. "You always want to win but sometimes you have to be honest with yourself and perhaps if Sone Aluko's shot at the end had gone in you might have asked was it deserved or not. Maybe not, but that's how it goes." Match ends, Brentford 1, Reading 1. Second Half ends, Brentford 1, Reading 1. Sone Aluko (Reading) hits the bar with a left footed shot from outside the box. Assisted by Leandro Bacuna. Attempt missed. Ollie Watkins (Brentford) header from the centre of the box is too high. Assisted by Rico Henry with a cross. Theo Archibald (Brentford) wins a free kick on the left wing. Substitution, Brentford. Theo Archibald replaces Florian Jozefzoon. Foul by Joey van den Berg (Reading). Ryan Woods (Brentford) wins a free kick in the defensive half. Attempt missed. Joey van den Berg (Reading) right footed shot from outside the box misses to the right. Foul by Florian Jozefzoon (Brentford). Vito Mannone (Reading) wins a free kick in the defensive half. Attempt saved. Andreas Bjelland (Brentford) left footed shot from the left side of the six yard box is saved in the bottom left corner. Attempt saved. Andreas Bjelland (Brentford) left footed shot from the left side of the six yard box is saved in the bottom left corner. Assisted by Ollie Watkins. Corner, Brentford. Conceded by Paul McShane. Attempt blocked. Florian Jozefzoon (Brentford) right footed shot from the left side of the box is blocked. Attempt saved. Ollie Watkins (Brentford) left footed shot from the right side of the box is saved in the bottom right corner. Assisted by Josh Clarke. Substitution, Reading. Leandro Bacuna replaces Liam Kelly. Attempt blocked. Andreas Bjelland (Brentford) right footed shot from the centre of the box is blocked. Substitution, Brentford. Nico Yennaris replaces Romaine Sawyers. Foul by David Edwards (Reading). Neal Maupay (Brentford) is shown the yellow card for a bad foul.